As discussed in Part 1, in 2002-2003 China tried and failed to get nearly a thousand precomposed Tibetan characters encoded in ISO/IEC 10646 (which is the international standard corresponding to Unicode). 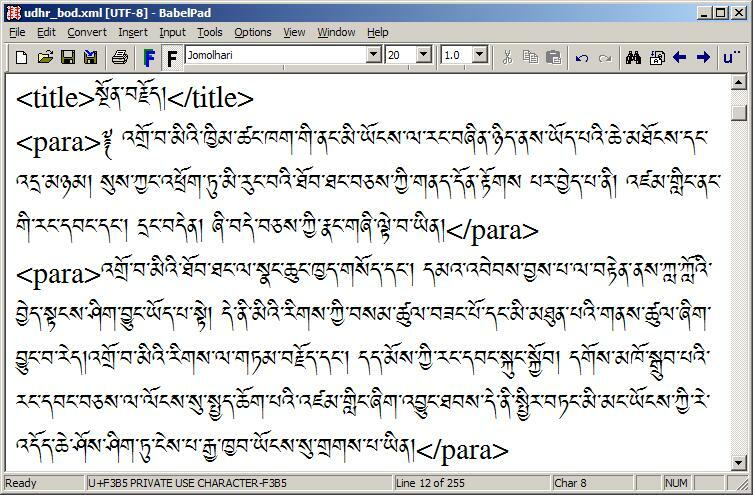 Level 2 would work with both standard Unicode Tibetan and the precomposed Tibetan extensions in the PUA blocks. Tibetan Extension-A (often referred to as "Set A"), covering the most common stacks, was published at the end of 2004, and comprises 1,536 precomposed characters in the PUA of the BMP at <F300..F8FF>. For the full repertoire see my mapping table between the Set A precomposed characters and standard Unicode Tibetan character sequences. Tibetan Extension-B (often referred to as "Set B"), covering rarely occuring stacks, is slated for the Supplementary Private Use Area-A in Plane 15. I'm not sure how many characters it is supposed to cover, but 5,664 is figure I have heard mentioned. It has not yet been published (as far as I know) and perhaps it never will be, as the success of OpenType Tibetan fonts is rapidly making the precomposed model redundant. 11 of the proposed BrdaRten characters aren't even included in Tibetan Extension-A (including the seven PH + H characters added in N2621 that I suspect are mistakes for the already included H + PH characters). These points make me wonder just how mature the BrdaRten proposal was and whether the 962 proposed characters were perhaps intended as a foot in the door for thousands more. The fact that the proposed BrdaRten characters were replaced by a quite different set of precomposed characters also makes a mockery of the Chinese claim that the BrdaRten characters were required to be encoded for backwards compatibility with legacy data. 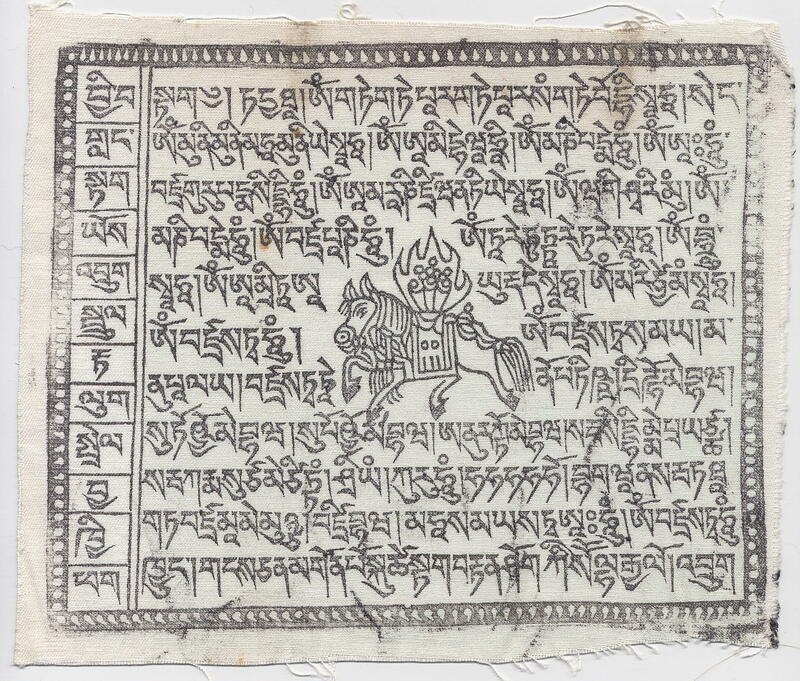 One interesting issue with Tibetan Extension-A is that it does not include a precomposed character for the character sequence ཨོཾ <0F68 0F7C 0F7E> (the "om" of the mantra Om Mani Padme Hūm ཨོཾ་མ་ཎི་པདྨེ་ཧཱུཾ།). This must be because the Tibetan block already includes the character TIBETAN SYLLABLE OM ༀ at U+0F00, and the Chinese took this to be equivalent to the character sequence <0F68 0F7C 0F7E>. However, this character has no Unicode decomposition, and under Unicode it is not equivalent to <0F68 0F7C 0F7E>, so it would have been better to encode a separate precomposed character corresponding to <0F68 0F7C 0F7E> in the PUA rather than use U+0F00 as if it were a precomposed character. If you do want to or need to work with Tibetan text encoded according to the PRC's standard for extended Tibetan, then it is possible to do so now using freely available software. 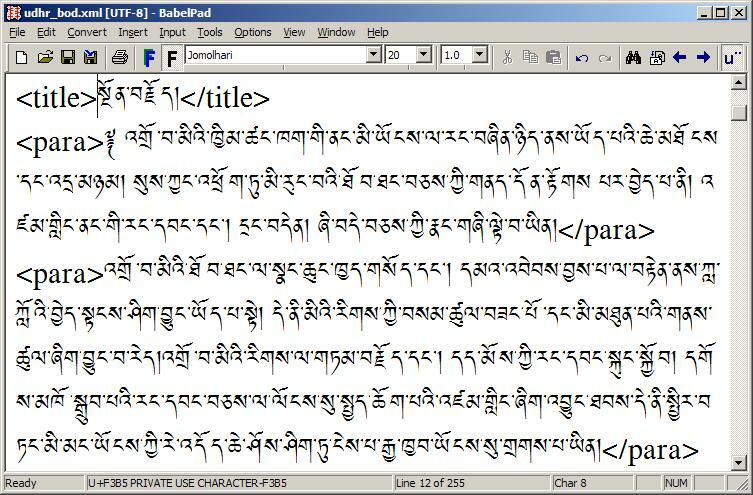 My BabelPad text editor supports the conversion (both ways) between standard Unicode character sequences and Extended Tibetan-A, and Chris Fynn's Jomolhari font supports both standard combining Tibetan and precomposed Tibetan. Let's give it go. 2. Then we select "Unicode to Extended Tibetan-A" from the "Tibetan" submenu of the "Convert" menu of BabelPad. Hmm, no discernable change, document renders identically ... has it actually done anything ? Well yes it has. Take a look at the Status Bar; the character at the caret position was U+0F66 TIBETAN LETTER SA, but now it is U+F3B5 PRIVATE USE CHARACTER-F3B5, which according to the Set A Mapping Table corresponds to the decomposed sequence <0F66 0F94 0F7C> sngo (the first syllable of sngon brjod སྔོན་བརྗོད། "preamble"). 3. Now hit the u" button on the BabelPad toolbar. This causes the text to be rendered in "Glyph Mode" (i.e. with all characters rendered as individual spacing glyphs). Note that the only difference is a slight change in the inter-glyph spacing and loss of smart line breaking. This shows that each stack is indeed a single character. 4. Finally, select "Extended Tibetan-A to Unicode" from the "Tibetan" submenu of the "Convert" menu of BabelPad, and it suddenly looks like we've accidentally switched to "Arial Unicode MS". Of course we haven't; we're still using Jomolhari, but now we're rendering each character as an individual spacing glyph so that the underlying difference between combining Tibetan and precomposed Tibetan is clear. So there you are, standard combining Tibetan and precomposed Tibetan both work equally well (at least on Vista; I'm forced to admit that precomposed Tibetan will work fine on everything from Windows 95 onwards, which is not quite true for combining Tibetan). People in the PRC can used the precomposed model and everyone else can use the combining model. Everyone should be happy now, right ? Well, we'll just have to wait and see. 1. How on earth are people supposed to enter Tibetan text consisting of thousands of precomposed characters ? You can't use a simple keyboard layout (as you can for Unicode Tibetan); a CJK style phonetic or transliteration IME (e.g. based on EWTS) would be useless for ordinary (or even most educated) Tibetans; and a "character picker" solution is totally impractical. 2. What will happen if China mandates support for its Extended Tibetan scheme as a requirement for GB18030 certification ? As I understand it, there is no such requirement at present and I have been told that there is no intention to make support for Extended Tibetan a GB1830 requirement, but things change. 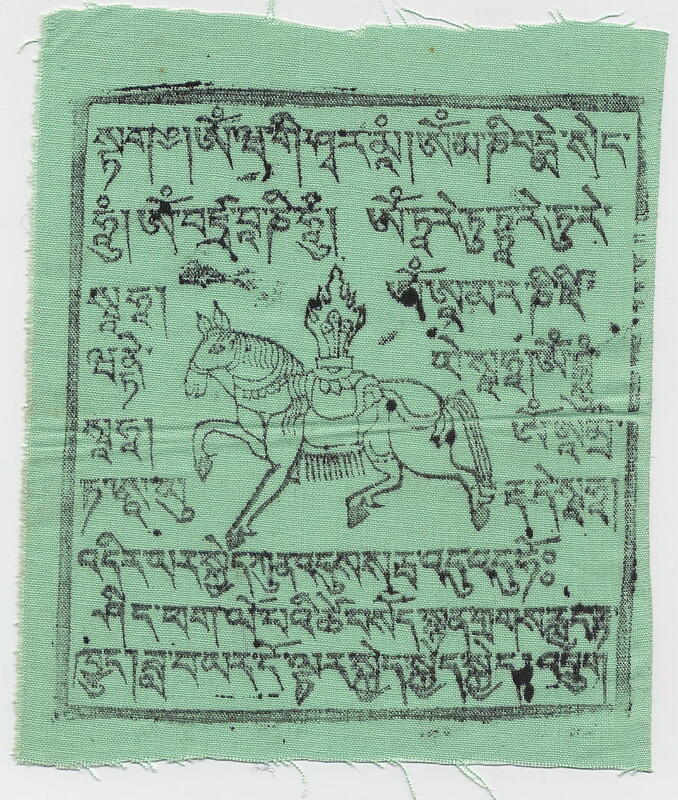 This post really ought to have been Part 3 of a History of Tibetan Encoding in Unicode, but Michael Kaplan's recent posts on the proposed alternative syllabic encoding of Tamil here and here have encouraged me to take a look at the latest twist in the saga of Tibetan encoding before I visit its early history of false starts and lost opportunities. 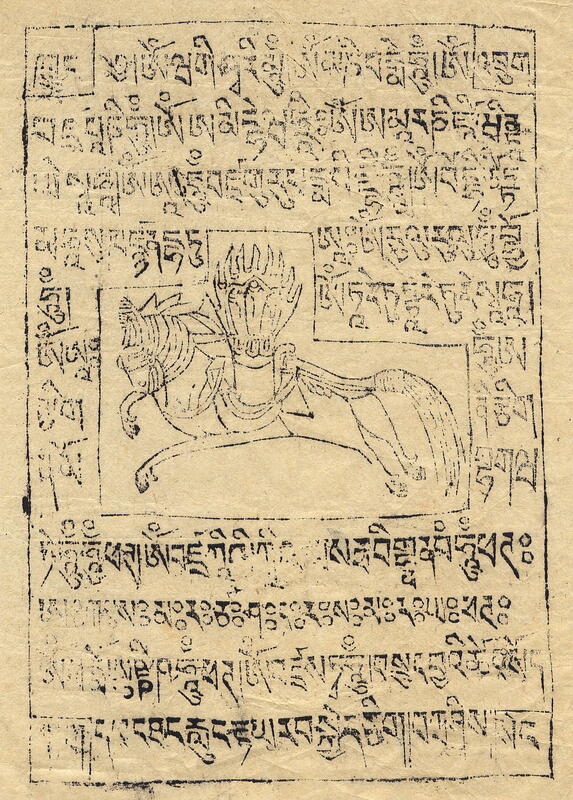 In the Unicode Tibetan encoding model a vertical stack (sgro སྒྲོ in the above example) is treated as a composite unit comprising (in the simple case, ignoring the complexities of Sanskrit transliteration and shorthand contractions) a single consonant from the range <0F40..0F6A>, zero or many subjoined consonants from the range <0F90..0FBC> and zero or one vowel sign. Thus the word bsGrogs is represented as <0F56 0F66 0F92 0FB2 0F7C 0F42 0F66 0F0B>. The encoded representation only specifies what the elements of a word are, not the precise relationship between the elements at the glyph level. It is up to the rendering system to put all the pieces together correctly, so that within a vertical stack all the component letters take the expected glyph shape (some superfixed and subfixed letters have special forms), are positioned correctly in relationship to each other and are joined together seamlessly. 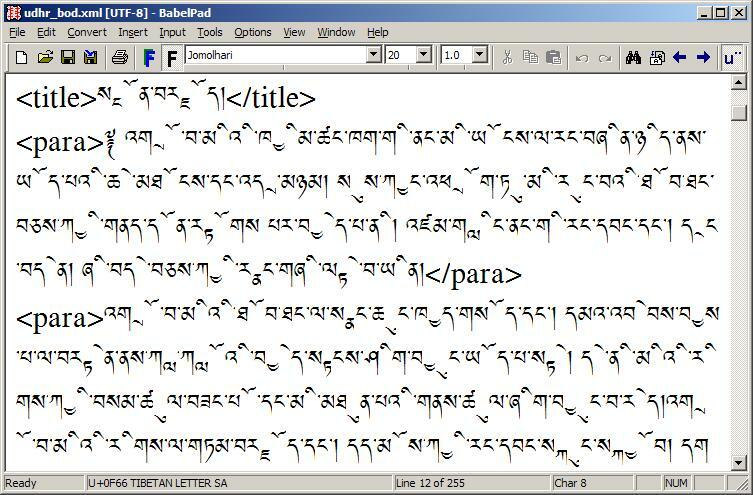 For several years after Tibetan was encoded in Unicode 2.0 (July 1996) no rendering system existed that was capable of doing all this, and using Unicode to write Tibetan remained a theoretical exercise. It was not until the early years of this decade that OpenType fonts supporting complex Tibetan stacks started to appear and Microsoft started to support Tibetan in its Uniscribe rendering engine. 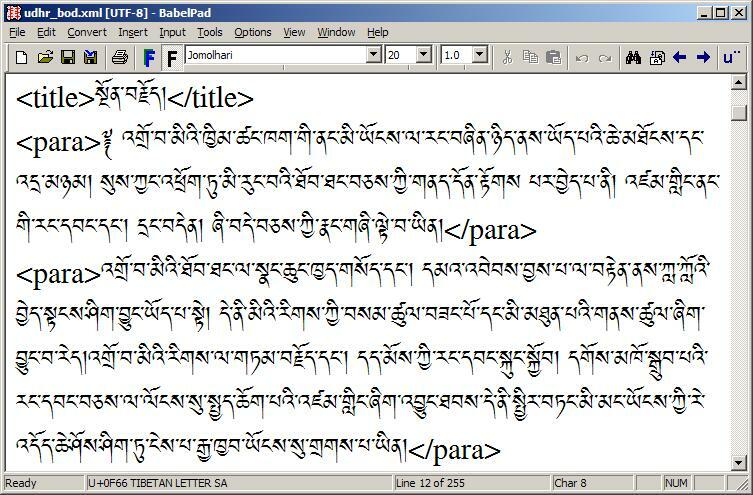 However, out-of-the-box support for Tibetan (including font and keyboard layouts) did not become available until the arrival of Vista, more than ten years after Tibetan was encoded. But if you are running Vista then Tibetan works pretty much perfectly, and, if you want, there are half a dozen freely available Unicode Tibetan fonts that you can use instead of the Tibetan font that ships with Vista ("Himalaya"). Try out my Tibetan Test Page to see whether Tibetan works for you or not. The problem is that the Chinese government had never really bought into the decomposed Tibetan model. 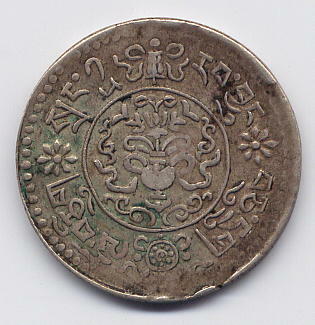 As far back as January 1994, when the encoding model for Tibetan was still under discussion, China submitted a proposal (N964) to encode Tibetan stacks as individual precomposed characters rather than as a sequence of combining characters, but this model was rejected in favour of the combining model. Then six years after Tibetan encoding had been finalised, in December 2002, the Chinese national body submitted a proposal to encode nearly a thousand so-called "BrdaRten" (བརྡ་རྟེན, pronounced daden) precomposed stacks in the BMP at <A500..A8FF> (see N2558, revised the following year as N2621, and further elaborated in N2661). These precomposed stacks were intended to be used in conjunction with those existing Tibetan characters that were non-combining (e.g. the consonants at <0F40..0F6A> but not the subjoined consonants at <0F90..0FBC> or any of the vowel signs), so that a word such as bsGrogs བསྒྲོགས་ would be encoded as <0F56 A5BA 0F42 0F66 0F0B> instead of <0F56 0F66 0F92 0FB2 0F7C 0F42 0F66 0F0B> under the existing encoding model (five code point units instead of eight). See my BrdaRten Mapping Table for a list of the 962 proposed BrdaRten characters (originally 956 in N2558), with their mappings to standard Unicode character sequences. On average BrdaRten stacks occupy 23% of Tibetan text and so BrdaRten cannot be ignored [hmm, this is where they forgot to mention the substantial reductions in storage costs that encoding precomposed characters would bring]. As the new BrdaRten encoding model would not displace the existing encoding model, applications would still have to support standard combining Tibetan, so the scheme only adds an extra layer of complexity for systems that need to fully support Tibetan. All of the proposed characters can already be represented as sequences of existing encoded UCS characters, as shown explicitly in document N2624. The addition of the proposed characters would thereby lead to normalization issues. The addition of the proposed characters would also amount to a change in the overall encoding model for the Tibetan script, thereby destabilizing and introducing more complexity for existing implementations conformant to the standard. WG 2 notes that the various implementation issues for BrdaRten Tibetan raised in documents N2621 and N2661 can be addressed in a variety of ways, involving dynamic conversion interfaces to existing legacy systems and other techniques suggested in document N2668. WG 2 suggests that the list of BrdaRten Tibetan stacks enumerated in document N2621 might be appropriate for processing by WG 2 as additions to a potential future annex of named entities represented by USIs, rather than be encoded as individual characters. WG 2 notes the issues on Tibetan script encoding and its implementation in document N2661, and invites WG 2 experts to work with Chinese experts to arrive at a satisfactory solution. China was furious at this outcome (see N2674), and vowed to oppose the encoding of any scripts "less alive than BrdaRten" in the BMP. They promptly opposed the encoding of Syloti Nagri and Phags-pa (see Resolutions M44.3 and M44.4), which was bad news for me as I was responsible for the Phags-pa proposal, and agreement from China was essential for its success. At the time I thought that their opposition to Phags-pa must be revenge for my opposition to BrdaRten (N2624), but I have been assured that the Chinese just wanted to keep the proposed window at <A500..A8FF> open (and Syolti Nagri was put at <A800..A82F> and Phags-pa put at <A840..A87F>). China may have lost the battle at WG2, but as we will see in Part 2, this was far from the end of the story.